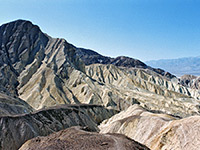 Named features on maps of Death Valley National Park include the Funeral Mountains, Coffin Peak, Hell's Gate, Starvation Canyon and Dead Man Pass - this is clearly a place with a bad history, reflecting the troubles and misfortunes endured by the pioneers who first traversed, inhabited and mined the region during the end of the last century. But despite the foreboding reputation, visitors today will find a place of amazing beauty with many colorful rocks and canyons, miles of pristine sand dunes, unique evaporative salt features and even a diverse range of wildlife. 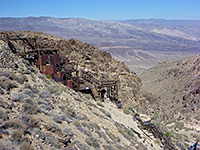 The park also contains many relics from a hundred and fifty years of history, which give an insight into the harsh life of the early settlers - borax and metal ore mines, ghost towns, charcoal kilns and other ruins. Petroglyphs and ancient foot-trails provide evidence of the Shoshone Indians who lived here even earlier. The valley is a long, low depression set in largely barren and unpopulated country of desert plains and rocky ridges, east of the Sierra Nevada Mountains. It is over 130 miles long, but only around 12 miles wide, running roughly north-south near the border with Nevada. From an elevation of 1000 meters at the north end, the land slopes down steadily and for 70 miles the floor is below sea level, reaching a low point of -282 feet (-86 meters) at Badwater, the lowest point in the Western hemisphere. The depth of the depression is partly responsible for the extreme high temperatures, which can exceed 130°F in summer. High, unvegetated mountains of sombre reddish colour flank the narrow valley on both sides; a few are high enough to have snow for many months of the year. The protected area, proclaimed a National Monument in 1933, was extended in 1994 (by the Desert Protection Act) to include an additional 1200,000 acres, mainly in the little-visited northwest section, and was upgraded in status to a National Park; this now covers 3 million acres, making it the largest in the US outside Alaska. Nearly 550 square miles are below sea level. There are many interesting sites and viewpoints beside the paved roads, and a good selection of short to moderate trails, but the majority of the area is reachable only by 4WD tracks or long cross-country hikes, this latter possible only during winter and spring owing to the high temperatures and lack of water at other times. Devils Hole, a flooded limestone sinkhole, is a small unconnected part of Death Valley National Park, within Ash Meadows National Wildlife Refuge in Nevada.